This test-of-concept model is based on the Arduino Pro Mini (ATMega168). It runs on a 1.5-V battery, using a voltage up-converter from Sparkfun.com. 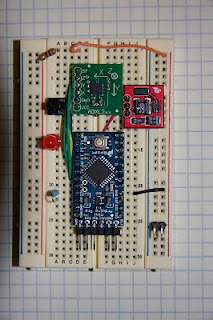 For a sensor, it's using a 3-axis accelerometer on a breakout board, also from Sparkfun. It has one button for control. When the device is reset, it waits until the button is pressed. When the button is pressed, it collects data at roughly 10 Hz for a brief interval, then goes into a wait state again. When the button is pressed a second time, it sends the data out the serial port. The red LED lights up during the data collection period, just so you can see what's going on. The corresponding computer program takes the data-dump from the Arduino and plots/saves it. I wrote mine in Python, but any language that allows communications via serial line —and they all do— will work fine. The device has serious limitations, though. For starters, the A/D conversion on the ATMega chip is only 10-bit, so the precision of the measurement is limited to one part in 1024. More importantly, the memory of the ATMega is severely limited. There may be 16k or 32k of flash on the microprocessor, but that memory is not available to variables. The data has to be stored in the microprocessor RAM, which is only 1-2k depending on which Arduino is being used. To make this more useful, I need to add memory: either in the form of an external memory chip or a micro-SD card. But the basic idea shows promise.